At Mountain Plaza Assisted Living, our residents are busy with plenty of activities and events! Our residents enjoy musical performances, daily chair exercises, arts and crafts, Bingo among other games, outings to events like Artcore performances and places such as The Science Zone, plus much more! 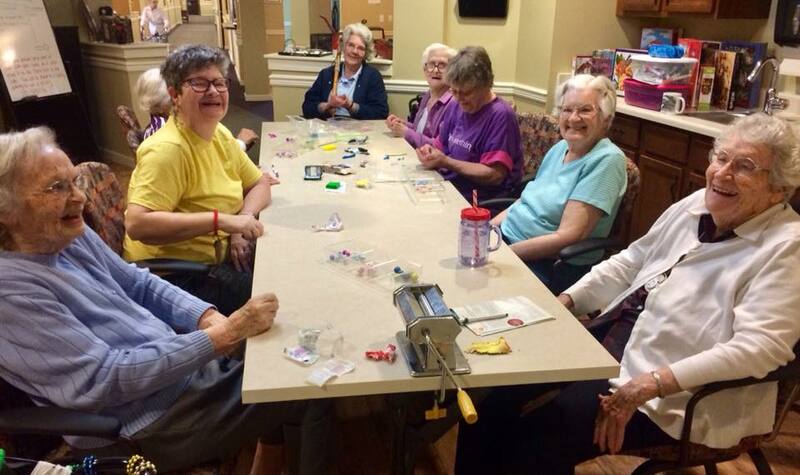 Residents attend “Craft Connection,” in the Art Room, where Bead Making is the activity. Find computer classes at the Natrona Public Library. From “Grow Your Tree” Genealogy Workshop to choosing an eReader, checking out eBooks to learning more about Pinterest and blogging; you will find informative computer classes at the library. During the month there are also tours of the library so you can make the most out of your library membership. Celebrate the 112th Bishop House birthday with home-made ice cream and the Wyoming Symphony Barbershop Quartet. Event is from 10AM to 2:30PM. Support the Bishop House by purchasing ice cream samples, used books, and memorabilia. Please join us for Coffee, Tea and Dee and enjoy a free cup of coffee or hot tea from P. Hawk coffee roasters. This FREE event runs on the first Wednesday of the month, from 8:30am to 11:30am, September to May. Located nearly equidistant between Billings, Rapid City, Salt Lake City, Denver, Omaha, and Boise, the Casper Events Center is a regional destination for conventions, tradeshows, and special events. Visit their event calendar to see what is happening. From museum tours to the Saturday Club and more, learn more about dinosaurs, minerals, gems and check out our fantastic exhibits at The Tate Geological Museum located on the Casper College Campus. The Cadoma Foundation invites you to visit the historic Bishop House. The M. L. Bishop House was placed on the National Register of Historic Places because of its importance with the early history of Casper and the surrounding area. The Cadoma Foundation works to preserve locations such as the Bishop House. The National Historical Trails Interpretive Center offers amazing exhibits on historical information relevant to Wyoming, but has a fantastic view of Casper. During your visit, you will be able to explore exhibits related to names that are truly legendary in Western history, and on the Oregon, California, Mormon and Pony Express Trails. Have questions about assisted living, memory care or other services for seniors? Call us today!